I love rivers. You can dream on rivers. Subject matter comes to you. They’re an ever-flowing muse. The Chao Phraya River is the ancient lifeline of Thailand. Rising in the mountains of the north, it passes through the agricultural heartland and into Bangkok where it divides into countless canals. 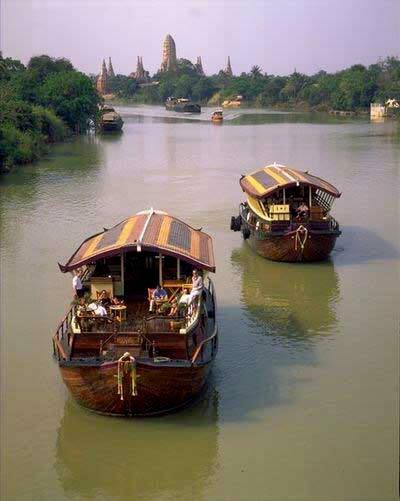 Here can be seen every imaginable type of boat — from lotus-filled sampans to tourist long-tails screaming like Cessnas. On rivers like this it’s important to resist the temptation to speed. You pay to be slow — but there’s a payoff. Here, among fragrant water-hyacinth, I tune with the monk. He’s like a dreaming Gibbon who wanders at the river’s edge and takes a long time to light up. One scene after the other in the flow. The architecture is the easy part. Temples glistening with gold. Humble fisher-huts on stilts. The in-betweens are collectable, digestible; they make personal and specific connections. There’s a bulging mangrove jungle effortlessly swallowing a king cobra. Then there’s oblivious, naked children diving and swimming. An elephant, knee-deep, tearful, remembering. The announcing odor of long-pole fishermen lying down with opium. Brightly clad Lisu tribal-women laundering rubies and sapphires. Pink-neon restaurants with black-haired girls beckoning. A sound like a steel band — then, nut-brown, wizened men beating hollow Buddhas out of used auto-body parts. Somebody’s goat, belly-up, floating. The process is like photography — a sort of “catchment” exercising the hunter-gatherer instinct. Getting material has to be one of the most pleasurable aspects of the creative act: Frame and compose. What’s going on here? What’s the action? What’s the meaning? What’s next? For most of us it’s a matter of really seeing what we’re seeing. My husband is a professional photographer, and I work side by side with him. I have just finished reading Hugh Brody‘s book, The Other Side of Eden which deals specifically with the hunter-gatherer societies and how they shape the culture in contrast to the farming societies of the world. I’m curious what you were thinking when you wrote this, and I would be delighted for you to comment on it, so I have yet another piece of the puzzle to bounce around. I am working to understand the creative process as it applies to my work with my husband—particularly his amazing ability to speak with his camera. The Other Side of Eden has challenged my thoughts deeply. You see, my husband is ADD (thanks for the letter on this topic) and prior to reading the book I had a metaphor of ADD people being hunter-gatherers by nature. Gathering material is generally accompanied and enhanced by a high sense of curiosity. This can take the form of the simple desire to learn, or in some way exploit. There’s no question that many artists become excited and focussed when they’re hunting material in high yield environments. Effective gathering is one of the great feelings. I’m not sure if there’s a correlation between ADD or not, but I’ve often thought the “bite sized” bits of photography are ideal for the instinct. Painting is more of a “delayed release” high. For those who haven’t seen it there’s considerable opinion and information about artists and ADD (Attention Deficit Disorder) here: Attention Deficit Disorder. Also at this page there’s a link to information from a professional coach who deals with artists with ADD. (RG note) Pay attention. It’s valuable to be able to focus. I’ve found that working alone is best. That way you can process material at your own speed and without the obligation that another body brings to the exercise. Further, some concepts require a concentration that can be destroyed by idle conversation or even someone else’s enthusiasm. Having said that, there’s also a time for a knowledgeable guide or an agreeable companion. Needless to say there’s no size fits all in this business, and artists must work in a way they find comfortable. For example, a male photographer working on a beach or in a crowd is well advised to work alongside a woman doing the same thing. Teaming up with a woman facilitates the activity and tends to put potential subjects at ease. A single photographer approaching a human subject can be a threat, but in the dual approach turns can be taken in casual friendliness and gentle set-up. Both parties make friends, get permission, and get good shots. This method fits in with the hunter-gatherer instinct and ideas of the pack or team. Nevertheless, there will always be lone wolves. Material gathering is a personal dynamic. It requires your unique perspective and sensibilities. It also requires the knowledge of your particular style and the limitations you may have set for yourself. Just as the appreciation of a symphony or a string quartet is personal—so is the appreciation of the collecting environment. My old friend Peter Ewart used to say, “To be alone with nature is to be one with nature.” It’s this “oneness” that’s worth developing. That’s when the ideas start popping. That’s when the environment seems extra enriched. The Chao Phraya River was almost too much to take in. I almost overdosed on the magic. The hunter-gatherer instinct is very much the fun part of the creative act. It’s the beginning of the creative process, whether it be hunting down information, inspiration, or method of application. The gathering of reference—tools, materials and avenues for the product of the creative act. It’s always a challenge. (RG note) There’s a danger that the creative process will stop with the gathering part. This can result in compulsive collecting and no finishing. I call the fear of running out of material “stuffophobia.” The inability to finish the stuff you’ve prepared for is called “finoplexy.” This unpleasant condition may be based on feelings of inadequacy, poor self-esteem, and other fears such as fear of failure and fear of success. Far removed from the scene in Thailand, I spent last evening in an Italian restaurant in Baltimore. It was my daughter’s birthday and she had decided she wanted to have dinner at a place called Rigatoni’s, which is owned by a Greek family and features “Greek Night.” The featured performer was Antonia, a Peabody graduate who studied ballet, turned belly dancer. The evening was filled with color, costumes, waiters with striped aprons, flowers and amber lights on the tables. The food was wonderful, the atmosphere exotic. The music was eastern rhythms with the live music of four Greek musicians, and between performances Omm Kathoum on CD’s. I of course was caught in the excitement of the evening and asked Antonia if I could photograph her while she was dancing. She agreed, and I spent an hour taking shots. Gathering material such as this was a lovely part of the creative process, it makes me feel as though I am taking advantage of life’s adventures. Some people seem to have their “hooks always cast” while others breeze along oblivious to treasure they might snag. I think artists have an opportunistic nature. They are often eagle-eyed to the point of obsession; they may even be predatory. What do you think of this? (RG note) Agree. The predation is of course not generally of a sort that would be antisocial. As a matter of fact these eagle-eyes are the antenna of society. Through their art, observation and imagination they provide a most valuable service to those who are often oblivious and who need to be shown. It’s good to note that artistic predation often has a higher goal — to capture the natural motif and turn it into something else. This is what I mean by “monumentalize.” I’ve always been interested in the idea of making a small unit that truly stands alone as a thing in itself. It has to have a quality I call “classic.” A small canvas or panel can do this. It can also be accomplished in the form of a forceful idea. Take a look at the following two letters as examples. We have inherited an earth that has ten times the human population as when our grandparents were alive. Add to that the exponential growth in the next century and the pressure on all of the other co-inhabitants — the wildlife that was for the most part here before us. The future does not look bright. And yet there are still spaces where we may be alone. We artists are able to find those places. We may be the last witnesses. We were there. You may be interested to know that artists from every state in the USA, every province in Canada, and at least 95 countries worldwide have visited these pages since January 1, 2001. This includes Roger Cummiskey, of Dublin, Eire who has done a series of paintings on “The River Gods of Ireland.” And Julia Norker who also cruised the Chao Phraya River. And Stan, of France, who’s looking for advice — he and a friend want to canoe the Mackenzie River in northern Canada next summer from Ft.Providence to Tuktoyaktuk.